Defence industry has played a key role in delivering air combat capabilities for the Royal Australian Air Force and, with the transition to a fifth-generation force, industry will play an increasingly important role delivering ‘catalyst’ platforms like F-35 and Growler. For Air Commodore Mike Kitcher, Commander Air Combat Group (ACG), the future of the Royal Australian Air Force is in "pretty safe hands" as the service continues to surge toward delivering Plan Jericho and the key capabilities that will ensure that the RAAF plays a critical role as both a separate entity and as part of the future 'joint force' of the broader ADF. "Air Combat Group is responsible for delivering the nation's air combat capability for the ADF and for government. We do this through the use of platforms like our classic Hornets, the Super Hornets and eventually with the Growlers, which are expected to reach IOC shortly and our growing fleet of F-35s," AIRCDRE Kitcher told Defence Connect. The coming decade is a period of transition and evolution for the RAAF marked by the introduction of key force multiplying platforms like E/A-18G Growler and the F-35A Joint Strike Fighter, and the capability enhancements for existing RAAF platforms like the E-7 Wedgetail and Super Hornet to enable the service to deliver the capability both Defence and government require. Industry plays an important role in delivering these new and enhanced air combat capabilities, which will enable the RAAF to meet the growing number of contingencies that may be required of it. "As a modern fighting force the RAAF needs to be capable of doing a number of things. We need to ensure that we are capable of contributing to low-intensity, but complex coalition air operations like we have been doing in the Middle East against Daesh. 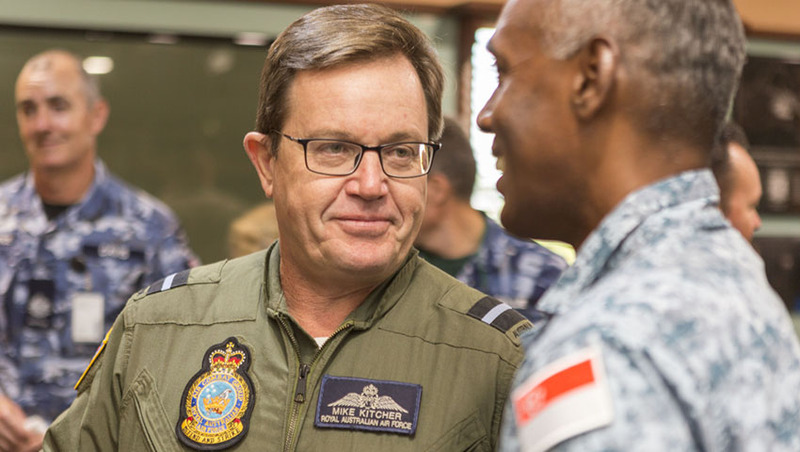 ACG needs to be capable of providing a standalone air combat capability capable of protecting Australia and her interests in a standalone capacity and, unfortunately should it be required, contribute high-intensity warfighting capabilities as part of a coalition force," AIRCDRE Kitcher explained. Developing this diverse range of capabilities requires close collaboration with key industry partners, across the prime and SME space. Prime partners like Boeing, BAE Systems and Lockheed Martin serve an invaluable role in helping the RAAF deliver the high-end capabilities in the form of platforms like Classic Hornets, Super Hornets, Growlers and JSF. This industry support comes in the form of both initial development and capability introduction and extends through to the sustainment, training support and maintenance capacities in partnerships with Australian SMEs like TAE Aerospace, Quickstep, Milskil and Marand, each of which provide niche capabilities supporting the delivery of Australia's air combat capabilities. "I was fortunate enough to spend some time out of uniform, as part of defence industry. I can tell you, the relationship of 20-30 years ago is vastly different to the one today, where it was once the case of a prime providing a jet and then you as the operator sending it back for depot maintenance. The relationship today is largely positive," AIRCDRE Kitcher told Defence Connect. Each of these industry partners provides and invaluable service supporting the RAAF's transition to a fifth-generation fighting force, particularly as part of Plan Jericho, which aims to establish and enhance the networked capability and interoperability of the RAAF within itself and as part of the broader 'joint force' model. "As part of delivering the air combat capability of the 'joint force', RAAF needs to focus on seamlessly developing interoperability and interconnectedness between its own key force multiplier platforms to ensure that as the RAAF becomes more interconnected over the next decade it is capable of working co-operatively and collaboratively with platforms like the Navy's Air Warfare Destroyers," AIRCDRE Kitcher added. Plan Jericho aims to leverage the growing power of technology, particularly sensor suites, data analytics and sensor fusion capabilities, to deliver leading-edge capabilities for the RAAF. This doctrine shift began with the introduction of platforms like the Boeing E-7 Wedgetail airborne early warning and control aircraft and the Boeing P-8A Poseidon, and will, for ACG, incorporate the fifth-generation F-35A Joint Strike Fighter. "We are on track to deliver initial operating capability (IOC) for the F-35A in 2020. By 2019, we expect to have approximately eight F-35s at Williamtown. By 2020, we expect there to be between 30 and 32. Australia is running the most ambitious JSF roll-out of any F-35 operator; we are aiming to deliver four operation squadrons, that is for everyone one Classic Hornet squadron we will deliver a fully operational JSF squadron in four years," AIRCDRE Kitcher told Defence Connect. "Industry today understand what we are trying to achieve and actively seek to be part of the team."